Saturday night I’m playing a show in South Carolina. It’s apparently going to be a pretty big outdoor event. I’ll be rocking my new Les Paul all night and doing some singing. Very excited. As you may know, I’m mainly an acoustic guitar player and vocalist. I’ve been playing acoustic guitar much longer than I’ve played electric guitar, but the last several years I’ve really fallen in love with electric. That said, when I’m playing on stage with an acoustic, I’m super comfortable. Not as much with electric. It’s not that I’m UNcomfortable…it’s just that I’ve played so many more shows with acoustic guitar that it’s like second nature. Electric makes me think more. As with most creative endeavors, there are LOTS of options when it comes to playing electric guitar. How you set up and play the guitar, how you set up the pedalboard (this could completely consume your life if you’re not careful), how you set up the amp, etc. Just like with recording, there really is no right or wrong way to set things up, but everybody has their own specific preferences. I talk to my buddy Pete. Pete knows his stuff. He eats and breathes guitar tone. He’s got so much more experience than I do, so I trust his opinion. Sure, I could figure this stuff out on my own through trial and error (which can get expensive), but I’d much rather procure some sage wisdom from someone who has worked through a lot of these questions already. Pete’s that sounding board for me. 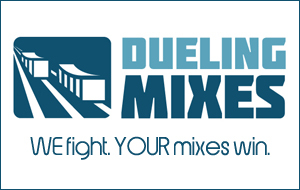 And it reminds me a lot of what’s going on over at DuelingMixes.com. The members over there are looking for someone with experience to guide them through the mysterious world of mixing music. That’s where I’m very comfortable. Graham and I have a lot of mixing experience. We’ve made millions of mistakes and worked through a lot of the common mixing problems people face. That means we can help you hone in on what’s important, and how to improve your mixes. But we’re also different people. Graham’s approach on a given mix will be very different from mine. Both good mixes, but very different approaches. As a member, you can see two effective approaches to a mix, and then pick and choose which techniques you want to “steal” and apply to your mix. We’re having a blast. I hope you’ll come check it out. And with that, I’m off to pack up my guitar rig and head off for a fun weekend of playing music.